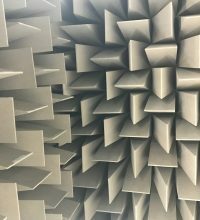 H&H Acoustic Technologies Ltd can offer a wide variety of acoustic materials to aid in the controlling reverberation, reducing sound and dampening sound in numerous applications and environments. All our acoustic materials can be supplied in sheet or as cut parts to your suit your design requirements and finished in a variety of different finishes depending on the environment the material is to be used in. Why are Acoustic Materials required and what are they? 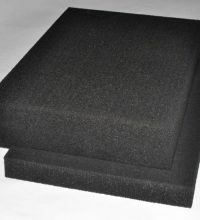 Is an extremely lightweight melamine acoustic foam (approx. 9kg/m³) that can be supplied as a sheet material in various sizes and thicknesses as well as cut and shaped parts. Given the weight Melatech® is an ideal acoustic foam for fixing to ceilings and high level applications and can be fixed using a number of differing methods depending on the application required and the environment that needs to be treated. Melatech® is probably, if not, the best performing acoustic absorptive foam available even at such a low density. Is a polyurethane foam typically weighing 90kg/m³ given the combined weight of the foam and fire retardant treatment process the foam is subjected to. Abfoam NF is ideal for use in general building acoustics (including profiled egg box shaped foam sheets), aiding in noise transmission within mullions and other architectural sections as well as plant rooms and other industrial applications and can be supplied in sheet form and cut parts. Abfoam NF is available in a number of differing thicknesses ranging from 6mm to 100mm and is generally supplied in sheet form up to 2000mm x 1200mm. Is a polyurethane foam typically weighing 27kg/m³ and available in a variety of sheet thicknesses as we convert block material in house. 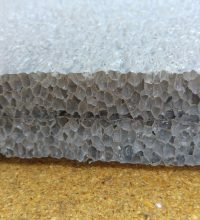 Abfoam F is ideal for use in general building acoustics (including profiled egg box shaped foam sheets), aiding in noise transmission within other architectural designs as well as plant rooms and other industrial applications. Abfoam F can be supplied in sheet form and cut parts. Abfoam F is available in a number of differing thicknesses ranging from 6mm to 100mm and is generally supplied in sheet form up to 2000mm x 1200mm. Abfoam F is certified and meets HF-1 when tested to UL94 (@11mm thickness) and Crib V to BS 5852: Part 2: 1982. A wide variety of alternative polyurethane, polyethylene and nitrile foams are available upon request for specialist applications. further assistance is available to ensure the required finish is achievable. Melatech® can be formed in to 3D shapes such as anechoic wedges, pipe lagging etc given the raw block sizes however Abfoam NF is limited to the sheet thickness being used. 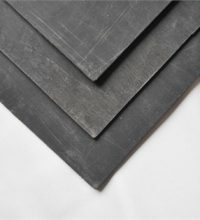 Damping sheets are used in a variety of applications to deaden the effect of noise that can be transmitted along or through structures that are typically manufactured from a metal product such as steel or aluminium. Such applications can include industrial enclosures, HVAC, white goods, automotive and agricultural. 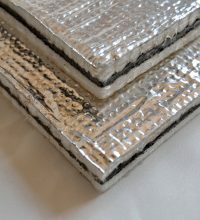 Damping sheets can also be used in conjunction with other materials such as sewn fibre quilts to form lagging materials or in sheet form acting as a mass layer barrier. Damping sheet material is supplied with a self adhesive to one face. 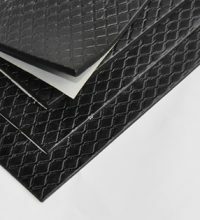 Barrier Mats are used in a variety of applications to reduce the effect of noise through the addition of mass to an existing structure or space and manufactured from a flexible and durable polymeric material. Such applications can include industrial enclosures, HVAC, bulkheads, vehicle floors and composite materials and are generally supplied in sheet form although it may be possible to die cut these parts. Coustilam is a range of laminated products that consist of a mass layer barrier sandwiched between 2 layers of acoustic foam as the core laminated product. Coustilam can then be treated with a wide variety of facing materials to suit the application and environment . The mix of sound absorbing acoustic foam and a mass layer barrier make this the ideal product for problem areas where there is a need to provide both a sound reduction and reverberation control solution. Coustilam is generally consists of a thin foam layer (6mm to 15mm) that acts as a decoupling layer, a 5kg or 10kg mass barrier material and a thicker foam layer (up to 50mm) that acts as the absorptive layer as shown in the table below. The Coustilam core can then be treated with the following materials from our standard range, although other materials may also be suitable for bespoke applications. The thick absorptive layer of foam can also be supplied in an egg box typre profile if required. Coustilam can also be supplied using other acoustic foams with further details available upon request. As well as a comprehensive range of acoustic materials, H&H Acoustic Technologies Ltd can supply a range of acoustic flooring and wall/ ceiling treatments to resolve sound reduction issues. We also are able to provide full support and acoustic testing through our fully qualified acoustic consultant. Description: By reducing the noise transmission within ductwork and pipes from the outside environment, DuctiLag® is able to control the noise released from such applications. DuctiLag® acoustic blankets comprise of several composite materials, depending on the application. 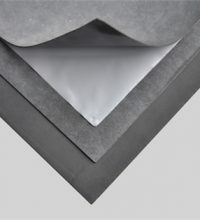 DuctiLag® H consists of a heavy polymeric barrier with a Class 0 foil surface to act as a vapour barrier and MelaTech® foam faced with black tissue to form a spacer layer. 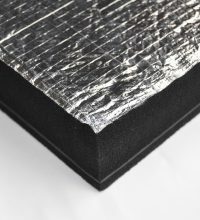 DuctiLag® P consists of a heavy polymeric barrier with a Class 0 foil surface to act as a vapour barrier and glass fibre quilt on the inner face to form a spacer layer. Description: The material is designed to damp resonant vibrations of the substrate that it is applied to. It is manufactured from a water based co-polymer emulsion, with mineral fillers in a polymeric binder. The compound is easy to apply and can be sprayed onto smooth and complex surfaces. Description: Acoustic heatshields are designed for use in areas of extreme temperature variation where there are also high levels of noise. 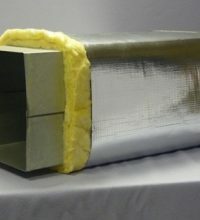 They are able to provide both a thermal and acoustic insulation. M949 Acoustic Heatshields: Glass fibre needlemat with aluminium foil faced on one side and self-adhesive backing on the other. 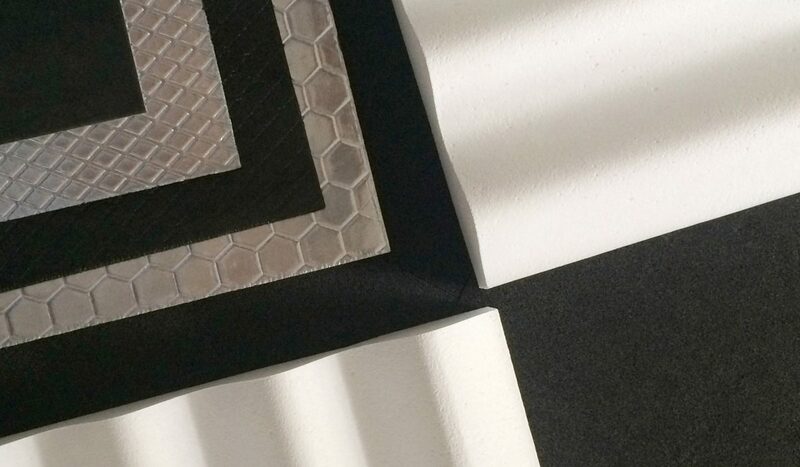 M1019 Acoustic Heatshields: Polymeric barrier core with glass fibre either side. The product is then faced in aluminium foil and backed in self-adhesive. Description: Anechoic wedges are designed to absorb sound and reduce reverberation. They are used to create anechoic chambers/ rooms. The word “Anechoic” or “an-echoic” means non-echoing or non-reflective. There are three products in our anechoic wedges range. MelaTech® foam is extremely lightweight and low density, allowing easy installation directly onto chamber walls. MelaTech™ has excellent fire resistance, thermal and acoustic properties. Graphite based polyurethane foam has consistent density and hardness, meaning wedges maintain their shape and uniformity. The spread of flame is prevented due to the graphite particles within the foam. Wedges are installed using either a single or double grid system. Mineral Wool wedges have good acoustic properties and are manufactured with a stockinette facing. Due to their heavy weight, they are usually installed using a grid system. Description: Designed to improve sound insulation of a product and reduce acoustic and vibrational induced noise from sheet metal. Bitumen based damping sheets are manufactured from bitumen, synthetic rubber, and minerals to create a flexible, visco-elastic material. Description: The PVA based damping sheet is designed for use where high levels of vibration induce noise from sheet metal. The damping sheet will help to reduce noise radiating from the metal. The PVA sheet is manufactured from polyvinyl acetate, creating a lightweight, flexible, visco-elastic polymer material. BM 5N and BM 10N - Barrier mats with additional mineral fillers which increase the mechanical strength and durability. Description: CoustiLam is a composite material consisting of sound absorbing polyurethane foam laminated to a sound insulating polymeric barrier. This configuration produces a product which can be used in applications that require both sound absorption and insulation. A wide range of surface finishes are available depending on individual requirements. Three products are available within the CoustiLam range, each with their own applications. CoustiLam FX is designed to reduce sound transmission and reduce noise. It is for general purpose applications. The composite consist of a polymeric barrier (5 or 10kg/m2) laminated between two layers of polyurethane. CoustiLam NFX is again designed to reduce sound transmission and noise. The composite consists of a polymeric barrier laminated between two layers of Class 0 polyurethane foam. As such it is used when there is the need for a fire rated surface finish. Both CoustiLam FX and NFX are available with a number of surface finishes. 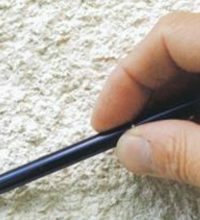 CoustiLam CVA-O is again a composite consisting of a polymeric barrier laminated between two layers of Class 0 polyurethane foam. It is used above suspended ceiling systems with the view to reduce noise transmission from room to room through any voids. Description: Designed to absorb noise over a range of frequencies, AbFoam NF is an open cell polyurethane foam available in two grades and is impregnated with fire retarding chemicals to achieve a Class 0 fire rating. It is used extensively in HVAC equipment. A wide range of facings and backings, as well as thicknesses are available for both grades. 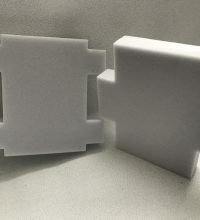 Description: Designed to absorb noise over a range of frequencies, AbFoam F is an open cell polyurethane foam available in two grades and is an excellent general purpose acoustic foam. It is used extensively in HVAC equipment. A wide range of facings and backings, as well as thicknesses are available for both grades. Description: MelaTech® is a lightweight, open cell, melamine foam. It has excellent fire resistance properties and as such does not flame or emit toxic fumes. Due to its excellent thermal and acoustic properties it has countless applications including acoustic wall and ceiling panels. To meet specific requirements MelaTech® can be faced or enclosed in a wide range of materials, or supplied with a self-adhesive backing. It can be cut or profiled into many shapes and sizes depending on individual requirements. It can also be supplied in sheets. 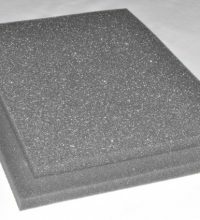 Description: EnviroSound™ is a closed cell polyethylene foam which, during the manufacturing process, has cells that are subsequently opened. This process results in giving the foam excellent sound absorption properties. The material also has the added benefit of being water resistant and so no additional films are required to obtain a moisture barrier which means its acoustic properties do not diminish when moisture is present. It also exhibits excellent fire resistance properties. Due to its excellent thermal and acoustic properties it has countless applications including acoustic wall and ceiling panels and where contact with water is likely.